Great old Islay nose. Sweet, marzipan, but still rich in game, ashes, peat. Very nice whisky. I like this a lot more than the OB 25 of which I've tried several versions against this one and in my opinion they always lose. Greasy smoke, liquorice candy, lime. sour wood, and this bold, wonderful smoked fish aroma . A rain-soaked pile of wood, some turpentine, and then a fireplace (woodsmoke, stone, plaster). Boiled or baked corn. Wood and burnt paper, quite juicy too. Closer to the OB 12yo in its range of aromas than the distillery's own 25 but then there's this nice sour wood note that announces it's an older one. The body feels clear, velvety, not too watery. tickles the tongue a bit but doesn't cut like young stuff. Slightly mineral, oaky, with some freshness that's no longer quite the lemon sweetness of young Caol Ila, instead going almost over to a vaguely floral aroma. If I hold it on the tongue for long enough it always seems to bring up this blackcurrant taste. Soot and tar candy too. What a quality dram. 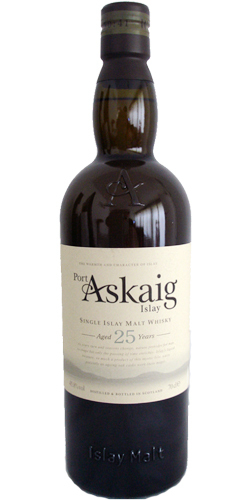 Very much Islay although the peat/iodine is much more restrained. 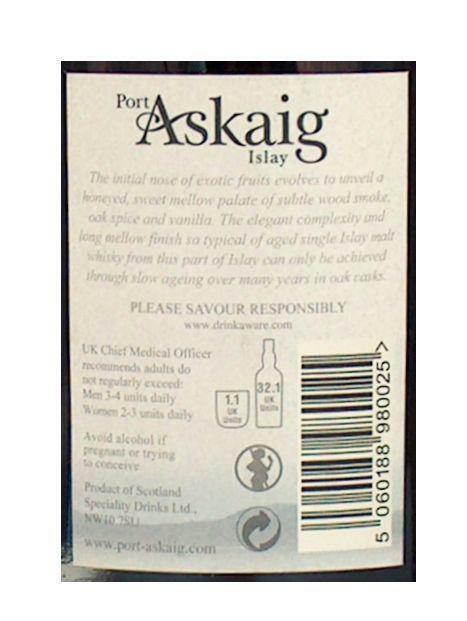 A lot of little fruity, zesty, island notes make this a somewhat complex, but very agreeable and very tasty dram. Waxy, oaky and peaty. Some apples and oranges. An oily and very nice ashy tobacco hint with an overlaying honey note. After a very long time, some espresso comes through. Lovely intriguing nose. Wow! What an incredibly pleasing oaky character. Citrus, zest, brine and a lot of woody spices. Some ashy notes but quite understated. A very nice round, quite soft mouthfeel. Beautiful. A small trace of smoke carrying notes of pepper, brine and citrus zest. Medium length but very pleasing. A sample from a friend. Easy to understand his high esteem for this one. Like it a lot. Green apple, chicory, fresh seaside, savoury smoke, lime and citrus, a waft of honey and muscavado, toffee-oak, liquorice-salmiak. Very balanced, a bit waxy and pleasantly salty and meaty smoke, like grilled beef without barbeque-sauce. Rounds up lusciously. Very good. Really pleasant. Soft and sweet, full-grain oats, liquorice and salmiak. Beautifuly aged, honeyd buttescotch notes of oak. Maple syrup smoke and Granny Smith with lemon. Dried tones of birch log-smoke, really fresh and brisk in it's smokiness. Enjoyable. 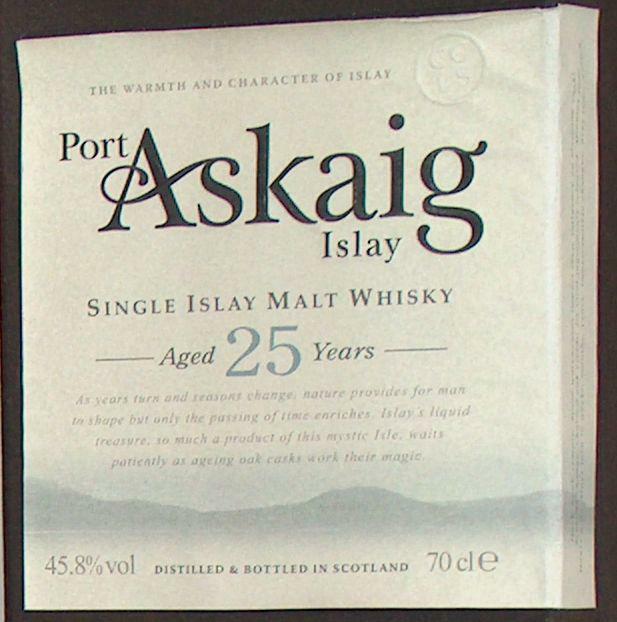 Port Askaig is the name of a small port on the east coast of Islays. Caol Ila distillery is located near the city, which is the largest distillery, Islay. Caol Ila malt whisky is known for its frugtede nature and dusty peat taste. From Port Askaig you can glimpse coastline on the nearby Isle of Jura on a clear day. It is this coastline there is the motif on the label on the aftningerne port Askaig. 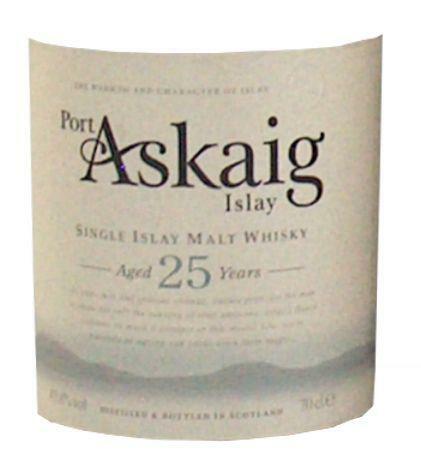 Port Askaig barrel strength is bottled by the classic alcohol content from the beginning of the 20th century, namely imperial 80 proof. For those who can not be that old that it can be stated that it is equal to 45.8% vol. in modern terms. Note by Speciality Drinks Ltd;The initial nose of exotic fruits evolves to unveil a honeyed, sweet mellow palate of subtle wood smoke, oak spice and vanilla. 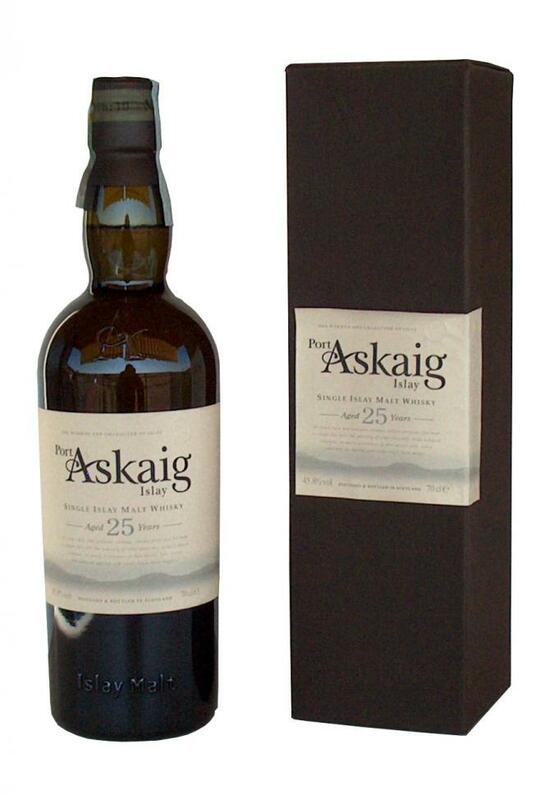 The elegant complexity and long mellow finish is achieved through slow ageing over many years in oak casks. with a bit of liquorice. Very complex and attractive. on the telly while I am tasting this). Aroma: Orange blossom, oak, melon, hints of cocoa, ash and burnt wood. Taste: Malt aroma, slight citrus flavor, roasted barley, traces of phenol and ashes. Finish: Long and slightly dry. This is my favourite age for Caol Ila and this is no slouch, but I'm sure it would have been better at cask strength. Fresh toast and pork sausage. Hot draff, a squirt of lemon and allusions to smoke. Deep clear malt with light lemon and faint ash. More ashy here, with gentle spices creeping in.